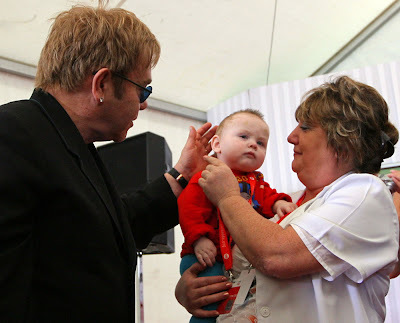 Brief and to the Point: Elton John: "Jesus Was a Compassionate, Super-Intelligent Gay Man"
Elton John: "Jesus Was a Compassionate, Super-Intelligent Gay Man"
Elton John has never been a big fan of religion. “Religion promotes hatred and spite against gays," the openly gay performer told the Observer's Music Monthly magazine in 2006. “From my point of view, I would ban religion completely." So it comes as a surprise that in Parade magazine this week, John claims that one of the central figures of Christianity is in fact a homosexual. In the same breath, John renounces celebrity. The man who at the Grammys wore soot on his face and performed opposite the ultimate exhibitionist, Lady Gaga, says he is done with fame. "Fame attracts lunatics," he tells the magazine. "I never had a bodyguard, ever, until Gianni [Versace] died. I don't like celebrity anymore." John made headlines at the beginning of the year when it was announced he staged an intervention to help designer Donatella Versace kick her drug habit. Prior to that he had revealed he was also supporting rapper Eminem in his fight against substance abuse. Perhaps all that philanthropy is going to his head?